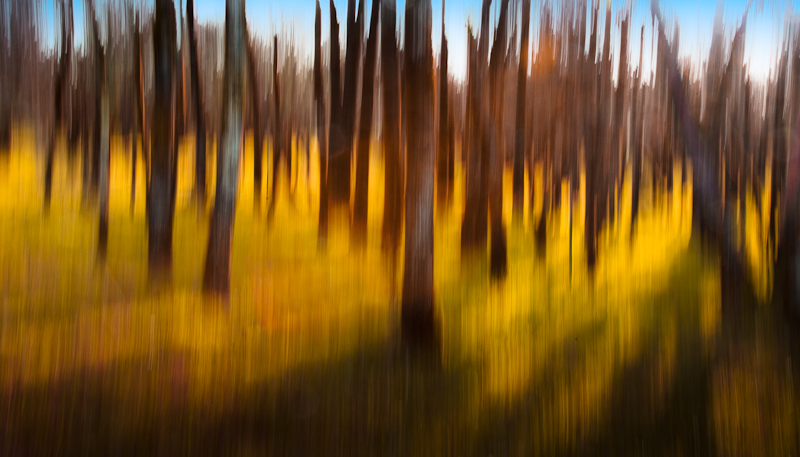 This entry was posted in abstract photography, creative process, photography and tagged abstract photography, panning, photography, trees. Bookmark the permalink. I agree – I think the kind of idea we’re discussing here is more the “concept”. Sometimes the concept can be identified after the shot is taken but before it is printed. Somehow this seems a little like cheating to me, but I do it all the time! I don’t know – I think the idea of studying everyday objects in new ways is a concept in and of itself. I guess I worry more about photographing with ‘intent’ – does each picture have, on some level, a purpose? Could I say why I am taking this shot? In some cases, it might just be to record something, or to explore a naturally occurring symmetry, or whatever – the point is that I’m aware of why I am taking this picture, so then I can make the ‘best’ decisions about how to take it (err… for a given, completely subjective value of best). I think the point you raise about being “aware of why” you’re taking the picture is the key one for me. Are some reasons better than others? Is there a value that can be placed on them? Are some reasons more complex, deeper, more meaningful? Should we try to pursue those? I don’t know. This seems like one of those subjects that would have different interpretations depending on the person. Do you not think a lot of the truly great music and art that exists today was a result of playing around, happy accidents, or whatever you’d like to call it? Do you think each masterpiece was created with intent? It makes me think of a particular incident. I went out one day to photograph skaters without any real purpose – so I guess you could say I was practicing my scales. But then I saw this scene where a man was almost silhouetted against the background of other skaters, and his head was hung down. In an instant I recognized the posture as fitting into a theme of loneliness which I explore often. That image, titled Wonderland, is one of my best sellers. While I had gone out without intent, where does that leave me when I recognize a possible image which fits into an existing theme? Does it make me less of an artist that the image happened by chance? Or does the ability to recognize the potential make you like the pianist who, while playing around, discovers a new composition? I agree completely that there is room for experimenting, playing around and for the serendipitous. In fact, it’s necessary to devote time to these things. My concern personally is that I wonder if too much, perhaps most, of my shooting falls into this category. What is the right balance to strike between planned (I like “intentional” better) and unplanned shooting? When I have decided upon a series or long term project and pursued it with intention, overall the work is more meaningful to me somehow than the shots I stumble upon. I’m not saying they are better photographs, at least individually. And others may not really care about my process or intentions so what is popular is also a tricky barometer. To continue the metaphor, as a musician I need to practice my scales and spend time on improvisation but I think another dimension of artistry comes when you have an idea, a vision and you pursue it – I’m sure all great symphonies were created this way. I believe all in all, I value this ability higher than setting out with a specific purpose. Very nice wipe btw, the inclusion of the sky is different and welcome. I don’t see these as exclusive – I think if you have an idea in mind, you still have to be in the moment to find the right way to express yourself. And grabbing a shot that you didn’t plan or envision in advance is fine, too. We all do that and should. I know, Bob, you’re starting work on a long term project that has tremendous potential meaning in it. Somehow I feel that if you pull that off at the quality you’ve exhibited in your more “spontaneous” work, you will find it a more meaningful experience because of the thought, planning and intent underlying it. This is a beautifully compelling image. I believe you (we) should be inspired by the vision without regarding the reason. An image which resonates with you, which stirs you, has its own reason. This one generates the struggle of growth against the showers of light reigning down into the realm of gravity. Its radiating energy seems increased by the lack of foliage. It generates its own mystery. A place unknown and perhaps not even believed. What more reason might it need?